A. There are three types of balloons: latex, foil and bubble. Latex balloons are made from a completely natural substance: the sap of rubber trees. Foil balloons are made of nylon covered with a metallic layer of aluminium. Bubbles are made with a stretchy plastic. A. Only latex balloons are 100% biodegradable. They break down at about the same speed as that of an oak leaf when exposed to natural elements, such as sunlight, heat, humidity, outdoor conditions... Foil and bubble balloons are not biodegradable, but they can easily be refilled, reused and they are recyclable. Q. Do balloons harm animals and the environment? A. Latex balloons, when released without ribbon or plastic items attached to them, are not harmful because they rise high into the atmosphere where they fracture in many small fragments that fall harmlessly back to earth. If animals eat these small fragments, they are safe because both coloring dyes and latex are non-toxic. Foil and bubbles can be a litter problem because they are very difficult to break down. Foil can be very dangerous when they come in contact with power lines because they conduct electricity and cause great damages, power outages and fires. Q. How long do balloons last? A. Here's a chart of average floating times of helium-filled balloons and lasting times of air-filled balloons. Q. Why don't my balloons float? A. 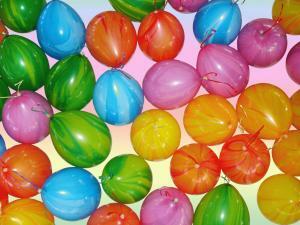 Balloons don't float unless they are filled with helium and they are inflated to their full size. Q. Why do balloons deflate? A. All balloons are porous and this means that the helium will eventually escape from them. 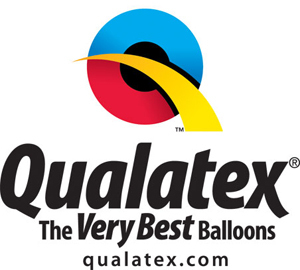 Latex balloons are the most porous and because of this they let the helium escape much quicker than bubbles and foil balloons. Q. Why do helium balloons deflate more quickly than air-filled ones? A. Helium balloons deflate quicker than air-filled ones because the helium particles are smaller than the air particles and then they escape more easily from the balloons. Air filled balloons do not tend to deflate as fast as the helium-filled ones because the large air particles stay longer inside the balloons. Air filled balloons can stay inflated for many months without going down. Q. Why do foil balloons deflate outside? A. When a foil balloon becomes cold the helium inside contracts, making it look deflated. When the balloon is taken back into room temperature the helium expands filling it again and so it floats like before. Q. What price are your balloons? A. The full price of balloon art include the costs of materials, labor, other direct expenses due to the décor or twisting service requested and depends on other factors such as the type of balloons used and the effect that you want to achieve. The full price exclude all hardware items that belong to Lazier Balloons, like bases, poles, frames, lighting equipment and effects devices. If you would like a quote please contact me. A. There is a Refundable Damage Deposit that is due two weeks before your event or before the date written in your contract. After your event Lazier Balloons will picks up all hardware, equipments and devices used for the décor. If all these items are in good conditions the full deposit will be refunded as soon as possible. If any of these items are damaged the deposit will not be returned. There is as well a Non-Refundable Fee, that is 50% of the full price, which reserves your event's date and time and guarantees Lazier Balloons will be available to decorate your event or offer you a twisting service. 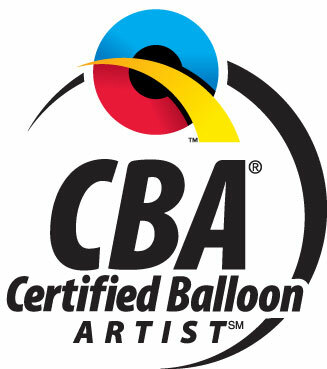 Usually this 50% of the full price is requested when ordering balloon decorations or twisting services. The remaining 50% of the payment is due two weeks before your event or before the date written in your contract. BALLOONS WILL NOT BE INSTALLED OR TWISTED IF FULL PAYMENT HAS NOT BEEN RECEIVED BY THE DUE DATE. A. Changes are permitted, but since sometimes it can be difficult to order supplies, no changes are permitted within 10 days of the event. Q. Are cancellations and full refunds allowed? - less than 1 month before your event...0% refund. On orders where custom imprinting, photo balloons, or design work has already begun, the entire payment must still be paid. Lazier Balloons will consider special circumstances when possible. If you believe that your circumstances merit attention please make a written request and explain your situation. Any partial or full refunds will be awarded at the sole discretion of Lazier Balloons. Q. Are refunds allowed because of bad weather conditions? A. No, they are not allowed, but Lazier Balloons will do everything possible to ensure a good quality outdoor decoration, but due to the unpredictable nature of weather, Lazier Balloons is unable to guarantee the appearance of outdoor decoration for any length of time. Lazier Balloons will do the best to ensure a good quality twisting service and will perform even when there is bad weather. Lazier Balloons strongly recommends to have an alternative place to go indoor. Lazier Balloons is not responsible for delays, damages or failures due to force majeure, inclement weather, fire, accident, strikes, riots, vandalism, war, non-availability of stock, parts, or materials; delay or failure of delivery of the products to Lazier Balloons by manufacturers suppliers or other persons, government action, legislation or regulation of any kind, or any circumstances whatsoever outside reasonable control.